I have updated my designs as requested sir. Thanks. 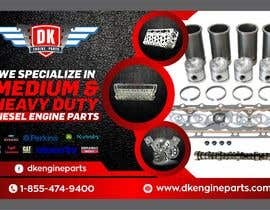 Please see the your Engine Parts banner Option 2, I am waiting your feed back. Please Check my entry NO : 84,85,86. Can you see each others design, some are very good and some are not close? This is a BANNER not a BUSINESS CARD. 5 FEET x 3 FEET not 5 INCHES x 3 INCHES. It will hang on a wall. can i still join this sir? Banner needs to hang on the wall. Left to right is 5ft. Up and down is 3Ft. Sorry for the miscommunication. I have attached a jpg of banner ideas. 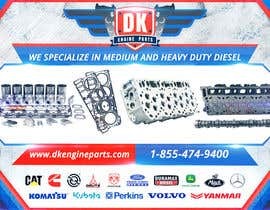 Also "Also we specialize in Medium and Heavy Duty Diesel Engine Parts. Caterpillar, Cummins, Deutz, Ford Powerstroke, GM Duramax, John Deere, Komatsu, Kubota, Perkins, and Yanmar" does not have to be on there. Try different options. 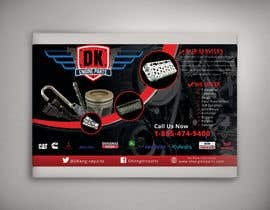 We would like phone number (1-855-474-9400) and website (www.dkengineparts.com) on there. 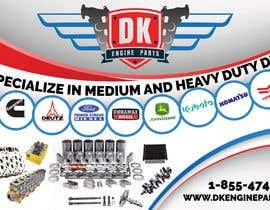 Also we specialize in Medium and Heavy Duty Diesel Engine Parts. Caterpillar, Cummins, Deutz, Ford Powerstroke, GM Duramax, John Deere, Komatsu, Kubota, Perkins, and Yanmar. You can make a list with bullets with these brands. And also 3 ft wide x 5 ft height ? or vice versa ? Length is 3 ft. and height is 5ft. Banner is to give to customers to hang in their shops. Is this horizontal or vertical? Length is 3 ft. and height is 5ft.